The film opens on the fourth of July, 1976, on the Coeur d’Alene reservation of Idaho. A house is burning. The family’s young son, Thomas, is miraculously saved from the fire after being tossed out of a window and caught by neighbor Arnold. The story flips between the past and 1998. The viewer soon discovers that Arnold as moved to Phoenix, leaving his son Victor and his wife behind. He dies there, and Victor decides to make the journey to Phoenix to see where is father was living and collect his ashes. Victor and Thomas don’t get along, but Victor decides to allow Thomas to come along on the journey because he has the money necessary to make the trip. Through this journey we learn more about each character, and they come to know each other better as well. A phenomenal cast including Adam Beach, Evan Adams and Irene Bedard (most well-known to the average American viewer as the voice of Disney’s Pocahontas) delivers an equally phenomenal script. Adams is certainly the stand-out here as bookish storyteller Thomas: an exaggerated but substantial performance. Beach is equally effective. Their characters are near opposites. Victor is bitter, hard-hearted while Thomas seems to always have a smile on his face and more than a few words to share. They play off of each other very well. This is certainly a unique film. It offers perspective into Native American culture, mindset and struggles told by Native filmmakers and a Native cast, which why I bought the film without viewing it first. Very few things peeve me more than non-Native actors being cast in Native roles, but that’s a whole other blog post. 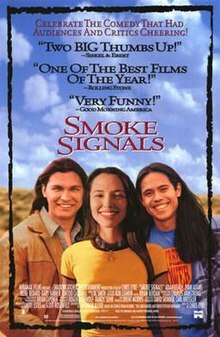 The humor of Smoke Signals is dry, sarcastic and very heavily based in Native history and culture, which doesn’t appeal to everyone and often causes the film to be misunderstood. But the film isn’t just about Native life, and shouldn’t only be appreciated as such. It’s also a universal tale of loss, friendship, misunderstandings and finding your identity. It’s humorous but also heartbreaking, not only because of the loss of Victor’s father but because of the struggles that the characters encounter in their everyday lives.